Business Valuations – The process of determining the value of a business, a portion of an enterprise or the per share value of the entity. We have years of experience in providing useful and objective analysis in valuing businesses. Our certified business valuations can assist in divorces, gift, estate, business disputes and shareholder controversies. Expert Witness Services – Stewart & Hurst has years of experience testifying in legal matters, whether supporting their method of valuation or to rebut another witness’s valuation. 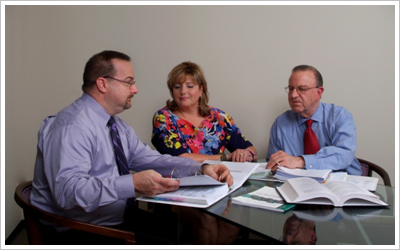 We handle expert witness assignments in forensic, valuation, tax, gift and estate matters. Forensic Accounting – The application of business information, financial reporting systems, accounting and auditing standards and procedures, and data analysis techniques to produce understandable reports for presentation at trial. Our team has the skills needed to perform Forensic Accounting, not only from an educational prospective but from years of real life in multiple disciplines. Family Law – Stewart & Hurst’s role in marital issues encompasses our numerous areas of expertise. The services needed in family law include expert witness testimony, litigation support, forensic accounting, valuation, electronic discovery and tax. Our understanding of practical accounting issues and services as well as the personal side of a divorce places us ahead of other firms. Litigation Support – Involves assisting the client and attorney with analyzing and compiling information efficiently for litigation. Stewart & Hurst helps the client and attorneys manage, document and compile the voluminous information that is prevalent in today’s litigation. Estate and Gifting – Our experience in estate and gift planning, preparation of gift, estate and trust returns, business valuation, and expertise in federal income tax positions the firm to help attorneys develop, implement and maintain the gift and estate plan. We work with the client, the attorney, the current accountant and financial planner to help archive the client’s goal in achieving their gifting and estate plans. Accounting Fraud – The firm has done a great amount of experience with fraud detection and prevention. We use our extensive knowledge and expertise in audit and internal controls to help detect fraud, recover lost assets and prepare reports to persecute offenders. Buy/Sell Agreements – Stewart & Hurst can provide a statement of value for closely held business’s based on the method or formula provided for in an existing buy/sell agreement. We can help in crafting a document that will allow a smooth transition of the closely held business. This document can address liquidity issues, prevent a sale to an unwanted party or develop an independent mechanism to determine the price or pricing formula. Shareholder Disputes – We can review and reconcile financial statements and tax returns for inconsistencies which could lead to the discovery of unknown assets or expenses. This review can determine the value of the disputed interest or damage sustained by the minority owner. Insurance Litigation – Stewart & Hurst can help determine the amount of claims in insurance litigation though their experience in financial, tax and forensic accounting. We can draft rebuttals to claims based on data develop during our discovery phase. Damage Analysis – Stewart & Hurst understands the economic damage analysis process and how to integrate the facts and legal strategy of the case in order to arrive at a defendable value. Some of the specific areas we have experience in are commercial, civil, and criminal fraud, as well as breach of contract and post-acquisition dispute, intellectual property infringement and construction litigation. Asset Tracing – By following the trail of assets or transactions, we deliver an easy to follow report that helps the court, the client and the attorney understand the complex flow of a set of transactions. Electronics Tracing – The experienced staff at Stewart & Hurst can efficiently extract data from most media by using the latest techniques. After retrieval of the information we can produce the data in an usable format for either continued work by our professionals or for use by the client’s attorney. Oil and Gas Royalty Valuation – Stewart & Hurst is capable of taking the raw data of a producing well or wells and the reservoir study, and create a report that can standup under close examination by either the opposing side or the Internal Revenue Service. Lost Earnings – We have handled numerous engagements dealing with lost wages. We establish a foundation for our position as to lost earnings, which can be used in wrongful termination suits and personal injury cases.